When looking for the best gas utility ATVs for sale, there are a lot of things to think about before buying! They come in various sizes fit for small children through grown adults. The features included are just as varied – from safety features, engine styles, colors, storage space, and more! Don’t let all of this overwhelm you, though! Before we get into our product reviews, here are a few important things to consider before investing in a new gas-powered ATV. Engine Specs: We start off by letting you know how powerful each engine is, so you can find the right one for you! Weaker engines are great for kids or easy terrain, and powerful engines are best for adults and tough terrain. 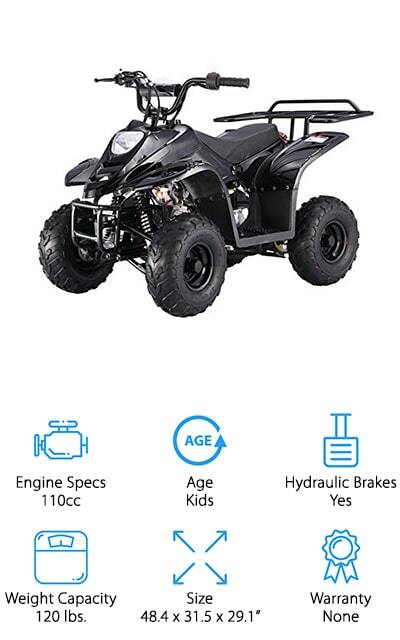 Age: We also let you know if each ATV is made for either kids or adults, so you can grab some for the whole family! This ensures you choose the proper size to meet legal and safety regulations, especially for children. Hydraulic Brakes: Hydraulic brakes use brake fluid to stop your ATV quickly. They are the same kind of brakes that are in your car or truck – just smaller! Hydraulic brakes are easy to use and may need their brake fluid checked periodically. Weight Capacity: In addition to choosing the right size, note the weight limits on each ATV, too! If you plan to use your ATV to carry hunting, camping, or other equipment, make sure it can hold you and everything you need safely! Size: Choosing the right dimensions for your ATV is important, too! Larger ATVs are great for wide-open spaces, but if you plan to trek through narrow trails, a smaller ATV will get you where you need to go without getting stuck! Warranty: Buying an ATV is an expensive commitment, and a warranty means the company will help you if your equipment breaks! Many of the ATVs we reviewed don’t have warranty information on their pages, so contact the seller for more information. Now that you know exactly what to look for in a new ATV, let’s find the right one for you! We reviewed several options, and here are our top 10 favorite utility ATVs the whole family will enjoy! There are models for youngsters, teens, and adults that are safe, durable, and a lot of fun! If you’re pressed for time, start off by checking out our Top Pick and Budget Pick today, and come back later to read about the rest! Our Top Pick for the best gas ATV for sale is this fun model from Coleman that’s great for your teenager or young adult! 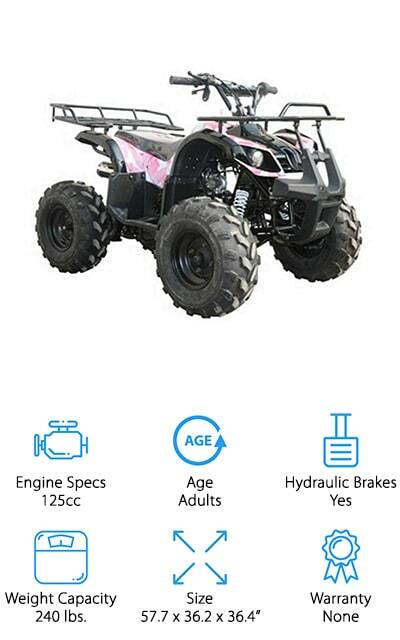 This ATV is made for kids 14 and up, and it’s also great for adults who are on the shorter/smaller side, too! 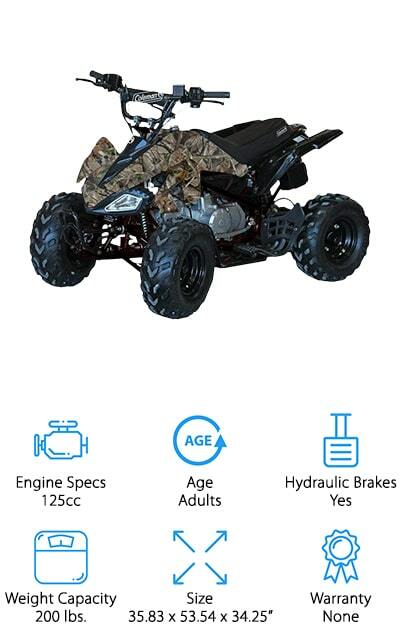 We like that this ATV has an electronic ignition and semi-automatic, clutch-less shifter, making this a great starter ATV for young, inexperienced drivers. It also has hydraulic brakes all around, so you can feel confident that the vehicle will stop exactly when you need it to! The tires are perfect for off-road adventures on dry and wet surfaces, and they’re comfortable while riding along on trails. We also like that the A-arm suspension system gives you plenty of control and reduces excessive bouncing on rough terrain. This would make a great ATV for a young rider who’s new to ATVs, or get one for a child who has grown out of their child-sized ATV! 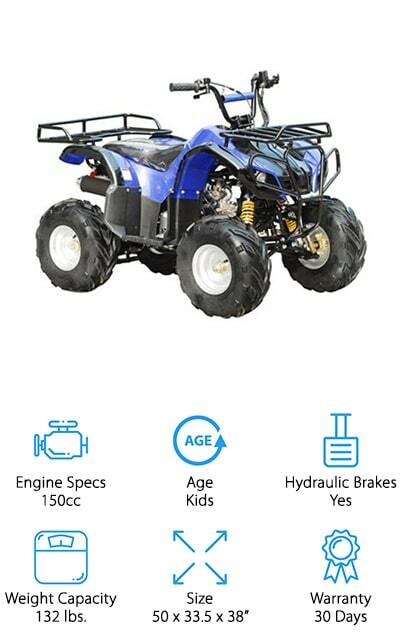 If you’re looking for a cheap ATV your child will enjoy, our Budget Pick from ICEbear is great! This ATV is perfect for small children to cruise around on trails, open fields, and your backyard! We like that it comes in 6 different styles, which are perfect for boys and girls. It has an electric starter and is fully automatic, so your child won’t need special training to shift gears or manage a clutch! For even more added safety, it comes with a remote kill key fob. This allows you to shut off the engine remotely to prevent your child from going too far, or to prevent potential crashes or injuries. It also has a throttle limiter, so you can control how fast the ATV can run, which is a great feature for small riders! If you want an ATV for sale cheap that is also incredibly safe for young riders, consider grabbing one of these for your next adventure! Next up is this 125cc 4 wheeler from Motor HQ that we think is great for teenagers and adults! We like this utility ATV for taking on long trail rides, overnight camping trips, or any time you need to haul some extra equipment with you. It can hold up to 240 pounds, and it has a large rack behind the seat to tie down a cooler, camping gear, hunting equipment, or whatever else you might need! There is also a small rack on the front to hold a backpack or tackle box. It can reach speeds up to 35 mph, but if you’re not comfortable with your child going that fast, you can limit the throttle speed. It also comes with a remote shut off key, so you can stop the vehicle without being on it. We think this is the best utility ATV for teens and adults who want to take their 4 wheelers on all-day or overnight adventures! For your younger children, we found another great utility ATV that is perfect for taking on their own fun adventures! This 110cc ATV can hold up to 120 pounds, which is great for small children and whatever extra they want to carry. It has durable racks on the front and back, which are great for carrying extras like a small cooler, sleeping bag, or some toys to play with when they get to their destination! This ATV can go up to 30 mph, but you can adjust the throttle to go as slow as 5 mph for young, inexperienced riders. It also has a remote engine kill switch for added safety. We also like that it’s a fully automatic engine that can also reverse, allowing your child to get themselves out of sticky situations! Oh, and it comes in either a pink camouflage or red spider web design, so you can get one that suits your little boy or girl! Next up in our hunt for the best 4 wheeler is this compact ATV from Mountopz that’s perfect for small children who are ready for their first ATV! The smaller engine only allows this vehicle to fun from 5-25 mph, and it has a speed governor you can use to limit how fast it goes – a great safety feature for young riders. It’s a fully automatic with an electric starter, so your child can turn it on and go easily. 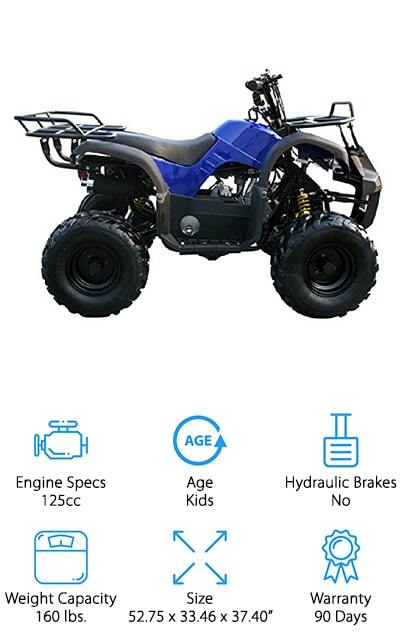 The foot brake is easy for even small children to reach, and the remote kill switch is great for parents who want to be able to stop the ATV with the push of a button. We also like that this mini ATV comes with a small luggage rack on the back, so your child can carry extra toys, snacks, or other fun stuff! This is a great ATV for beginners, and would make a great gift for your little rider! Once you find the right ATVs for your kids, now it’s time to find the best gas quads for sale for mom and dad! 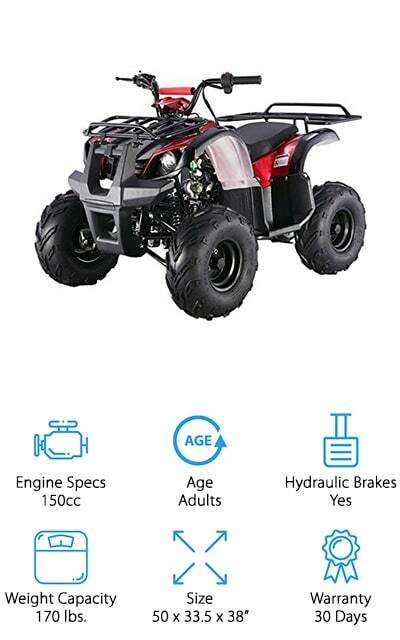 This four-wheeler from SaferWholeSale is a powerful and fun ATV for adults and older teenagers to enjoy! We like that it’s a fully automatic motor with reverse, so you can get out of sticky situations or maneuver in tight spots with ease! It can go up to 35 mph, and it has hydraulic brakes to help you stop quickly to avoid accidents. The manufacturer’s website says it can hold up to 300 pounds, which is plenty for you and some extra equipment! We also like that it has large luggage racks on the front and back to tie down extra camping, building, hunting, or fishing gear! It’s also CARB approved for those of you who live in California! This is a great ATV for outdoor adventurers, construction workers, and speed enthusiasts to get where they’re going! For your little ones, this 110cc gas ATV from TaoTao is a great starter vehicle to teach them about driving safely while having fun. It’s great for kids ages 4-10 and can hold up to 132 pounds. The front and back racks allow your child to add their own camping gear, lunchbox, toys, and more for added fun! 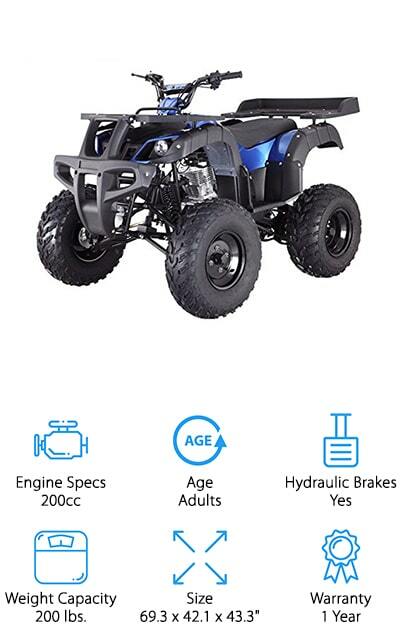 To keep you new riders safe while they learn the ropes, this ATV comes with a throttle limiter that allows you to set the maximum speed to whatever you feel is best. It also comes with a remote kill switch that you can use at up to 150 feet to stop the engine if your child gets too far away or ends up in an unsafe situation. The hydraulic brakes are also a great safety feature, and they will stop quickly when needed. This is one of our favorite ATVs for young riders who are starting out on their first off-roading adventures! Next up is another great model for kids to ride from HML Motor. 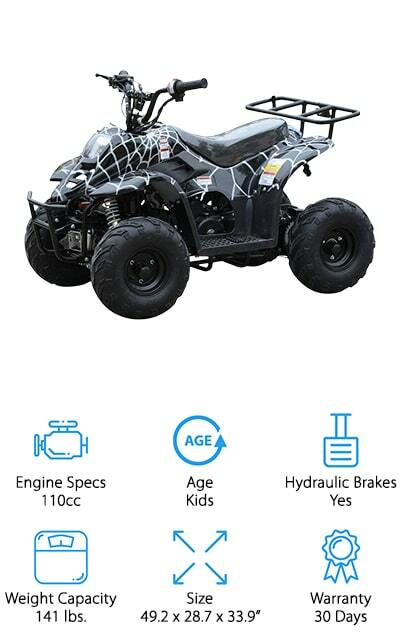 This ATV is made for kids ages 12 and up, and it’s safe for both beginner and experienced riders. For new riders, it comes with a throttle limiter, so you can set the speed lower to prevent kids from going too fast. It also has a kill switch you can use to shut off the motor if your child goes too far or gets into a potentially unsafe situation. If your child is more experienced, you can leave off the throttle limiter and let your child go up to 35 mph for some extreme fun! We like that this ATV has large front and rear racks to add extra equipment, and it holds up to 235 pounds. Your child could easily take this into the woods for an overnight campout with friends, tag along on a family hunting trip, or just tear it up on local trails! If you live in California, you know finding CARB-approved quads for sale can be tough. This youth ATV from SaferWholesale is not only CARB-approved, but it’s also fun to ride! 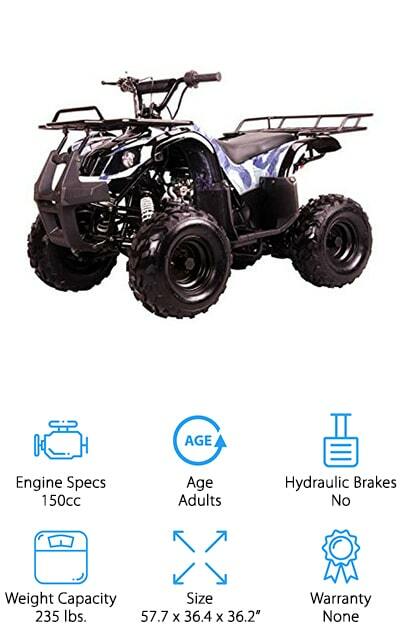 We like that this ATV is heavy duty, with large wheels and sturdy frame that can take whatever terrain you ride onto! The push-button ignition and fully automatic motor make this easy for children to drive without extra training. To keep your child safe while they’re learning to ride, it comes with a speed governor that allows you to set the top speed to as little as 5 mph. It also has a remote controlled kill switch that shuts the motor off if your child gets into a tough situation. To help keep them steady on the ATV, this model also has large, ridged footrest for extra control. Oh, and it also has two luggage racks for adding extra equipment, toys, and whatever else they need on their next fun adventure! Last up in our search for the best gas utility ATVs for sale is from the popular ATV brand TaoTao. 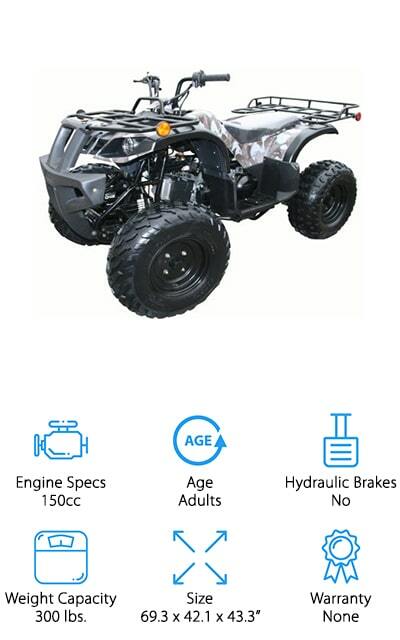 This ATV is purely for the adults in the family, with a 200cc engine that can reach speeds up to 55 mph! The electric ignition is much easier to start than a traditional kick-starter, making it easier to get running in a hurry. The 4-speed manual engine gives you control over the ride, and it works in reverse to get you out of tough spots! We like that the steel frame and large wheels give this ATV all the sturdiness it needs to handle even the toughest terrain. To carry extra equipment, it comes with large front and back racks that hold a lot! This is a great ATV for adults looking for a vehicle to last for years to come. It also comes in either blue or camouflage, so you can blend in or stand out in your surroundings!